Happy Wednesday! Things have been a little quiet over here as I continue to make preparations for International Quilt Market! Since Ohio is on the way to Pittsburgh, I'm leaving early to spend a few days with my family. So I am trying to get as much done before I leave as possible! I had to pop into today and share a very exciting project with you! 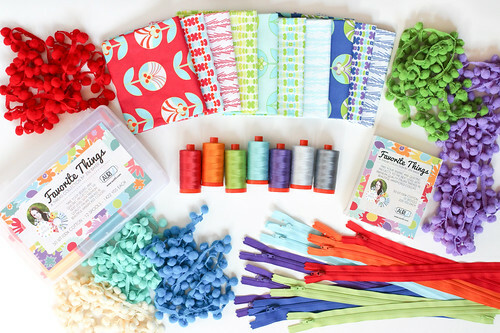 I am happy to announce that I have a thread collection with Aurifil Thread coming out soon! I love using Aurifil in my projects, so this was a dream collaboration! 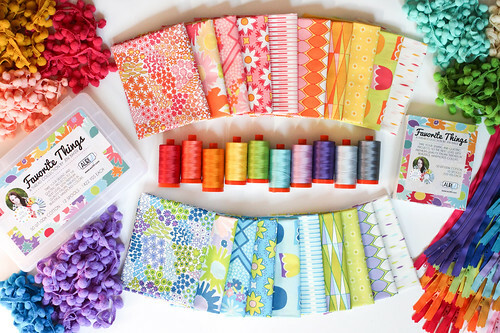 The collection is called Favorite Things, and it features some of my favorite colors from all of my fabric collections with Art Gallery Fabrics! I wanted it to be really versatile, and able to stand on it's own beyond my fabrics. Also, I love rainbows! The threads are 50wt cotton, which is my favorite for piecing and quilting. You'll find twelve 1422yd spools in the large box, and ten 220yd spools in the small box. I had lots of fun taking photos of the threads with my collections and some of my favorite notions! 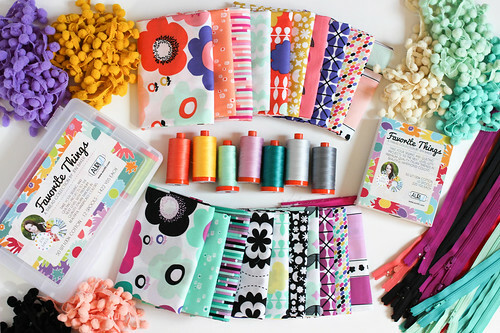 Zippers are all from Zipit, and pom-pom trims are all from Jaceycraft! 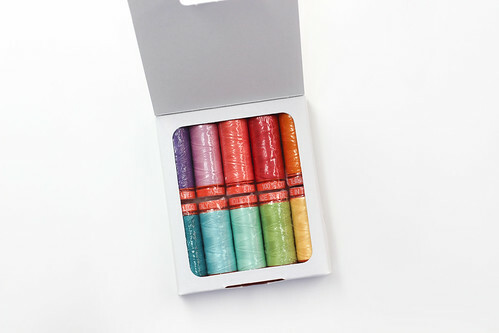 Aurifil Threads with Color Me Retro. Aurifil Threads with Dreamin' Vintage. 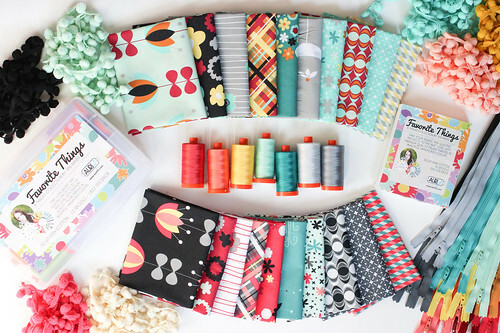 Aurifil Threads with Geometric Bliss. As you can see, the threads really do match all my collections! The two grays are my very favorite gray threads, and while they match Nordika perfectly, they really blend well with everything! Favorite Things will debut at Quilt Market next week! I will let you know when it will be available to buy. they're so awesome Jeni!! I love the pictures. The colors are gorgeous of course! These are just so brilliant and beautiful!! Love, love, LOOOOVEE them!! And Dreaming Vintage is just the happiest set of fabrics ever!!! can't wait to play with both! I love all the pretty colors! So excited to see what else is new from Market. These are lovely! I just received my first box of Aurifil from my hubby for my birthday! Love it! I love the collections together - sigh, so beautiful!! Your thread is as beautiful as your fabric. Love them both. Great colors! I just got some of you Dreamin' Vintage fabrics from Hawthorne Threads and I LOVE them!! I already have a project in mind!! Can't wait for your new fabric line, geometric bliss, to be released. 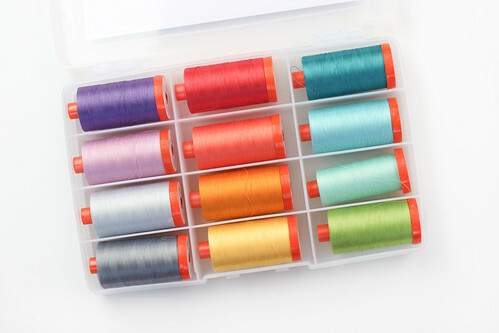 It is beautiful and so is the thread collection. I love Aurifil thread. Best wishes to you for a same fun trip, especially the family time. Jeni, your fabric is just amazing, just adorable. You know I love it like crazy. I am so glad I follow your blog. You are such an inspiration -- even to me, the tired and bedraggled lol. and find a little time to sew every day. Have fun at Quilt market. I will definitely be wanting some of that thread!! Lovely colors. I love all the fabric too !! What a beautiful palette of thread! Your collections are beautiful and who doesn't love the fabulous fabric quality of Art Gallery! Aurfili is amazing! I love all their collections that have been put tougher for fabric lines. The only thing I would like to see is some of the thread collections in the heavier weights for quilting, rather than just the 50 wt.